Atlanta golf community of Heron Bay and volunteer with the Henry Players, Henry County Georgia’s community theatre group. 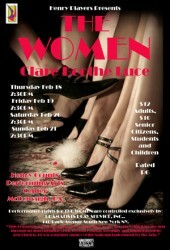 Kay took the stage recently in Henry Player’s production of “The Women,” which ran Feb. 18-21. “The Women” is an all-female cast which focuses on the stories of New York’s upper echelon. Glitz, glamor and men problems prevail through the play which takes place in the late 30’s. Though Damon did not act in this production, he has been a key part of others including a 2009 production of “Sweeny Todd,” which he directed. The couple also owns a local salon, Damon’s Design Team, and have donated their time to do hair and makeup during productions. Atlanta lake community to go see the productions. However, it’s never hard to find a friend or two to come out and support the cause. One of the wonderful parts about living in this master-planned community is that more often than not your neighbors are also your best friends. Heron Bay residents are known for getting out into the community and getting involved. In addition to donating time at the local theatre, homeowners have also organized blood drives, clothing drives, canned food drives, a giving tree and raised over $25k for the Hands of Hope Clinic through the annual 5k race also known as the Goblin Gallop. Sales and Information Center to learn more.